3.0/1.0 micron filtration of oil, water and dirt particles. AFF grade is mounted in the main air line to remove liquid oil, water and particles of all kinds. It is used as a prefilter before a refrigerated air dryer. It is also used together with high performance filters AM or AMD. AFF is supplied as standard with internal auto drain and differential pressure indicator. 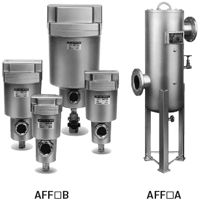 AFF filters have cast aluminium bodies for up to 3" screwed pipe (flow at 700kPa and 20°C). Also available as floor standing units with flanged connections and carbon steel bodies. For main line removal of large particles, rust etc., 125 micron stainless steel mewh element is optional for AFF 125, 150 and 220A. All floor mounted models include a prefiltration chamber which ensures very low pressure drop and long element life. AMD grade will remove particles, liquid and oil aerosols of more 0.01µ. It is used as a final filter in industrial application. It is recommended as a pre filter of the air supply to presicion instruments or for clean room applications. AMD is supplied as standard with internal autodrain and differential pressure indicator. AMD is also available in 316 S/S. Unbelievable price on Air Filters, SMC in Puchong (Malaysia) company Grandco Engineering, Sdn Bhd.